The image of a seed is a powerful one. That a huge, craggy oak tree begins life as a tiny acorn seems improbable, bordering on miraculous. It reminds us of the creative potential of small things, and there can surely be no better antidote to despair! Here at Treesponsibility our aims are to educate people about the need for action on climate change, to involve local communities in tree-planting, and to improve our local environment and biodiversity for the benefit of local people and future generations. 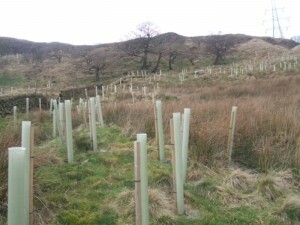 In recent years we have been focussing much of our attention on tree planting for flood mitigation, and work in partnership with bodies such as the Environment Agency, Calderdale Council and the National Trust. 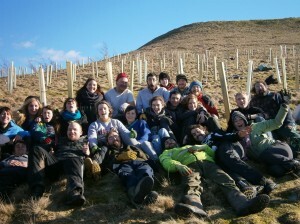 Hundreds of people from all walks of life have been involved with the project, including local volunteers and landowners, schools from Calderdale and beyond, a wide range of community groups, and visitors from further afield joining us for our tree-planting weekends, details of which can be found on this website. Since its formation in 1998, Treesponsibility has planted an average of 5 hectares every year – that’s over 12 acres of new woodland per year. Treesponsibility is also founding member, and a key delivery partner in The SOURCE partnership, which aims to take preventative action to help create a healthy, resilient and biodiverse landscape, for the benefit of all the people in our valley both now, and in future years. We’re looking forward to expanding our project over the coming years, and would like to play an additional role in the delivery of the regional forestry strategy by offering help and support to anyone interested in starting a similar project in other parts of the region. We think that it is not unrealistic to achieve roughly 10-20% of the region’s targets for new woodland through community reforestation. We can offer skill-sharing workshops, passing on practical advice on obtaining, evaluating and designing planting sites, maximising involvement, raising resources and communicating the science of climate change.